Colorful apartment with sea view, near the beach. Here you will stay in a very special apartment, located in Villa Victoria, a large villa from the mid 1800s when the British discovered Cannes as a haven in the fall and winter. The apartment is located on the second floor with a panoramic sea view. You have a double bed in the sleeping area and if you need extra bed there is a sofa bed in the living room. To the beach, Plage du Midi, you walk in 2-3 minutes via a private street. 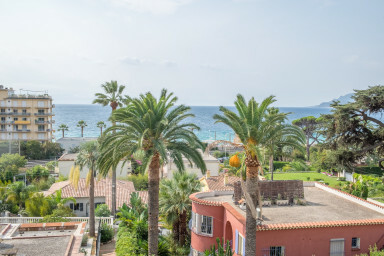 The apartment is located in the western part of central Cannes, next to the old town of Le Suquet, just a short walk from all the amenities Cannes has to offer: Beach, Entertainment, Shopping and Restaurants. Just 180 meters(!) to the well-kept municipal sandy beach Plage du Midi. There are also private beaches nearby where you can rent a sun bed with parasol. A series of bars, cafes and restaurants stretches from the beach to the Palais des Festivals with its famous red carpet and further to the Croisette. If you want to start the morning with hot freshly baked bread, fresh fruits and vegetables, quail eggs, cheeses and other delicacies - go to the Marché Forville, the central food market of Cannes, which is open every day except Mondays. You will reach it after a pleasant 10 minute morning walk. And on Mondays they have a flea market there where fans of antiquity can find many interesting things. The excellent location saves you from having to use a car, all the delights of Cannes are nearby! But if you decide to come by car, you may park for free in the courtyard of the manor or in a private street nearby closed to strangers by a barrier.